We know it’s been a while, but we wanted to wait to bring you the really big news at one time! 4 major things have changed with primaERP TIME TRACKING: We have a new website, new pricing, improved reports and last but not least: We now have a test version of the Android App! 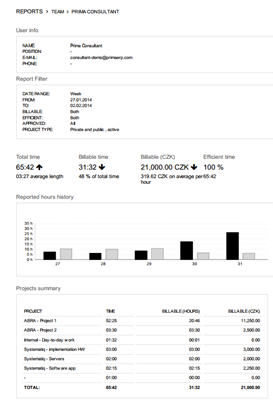 All 4 reports are now printable in a very nice and clear layout, helping you have an improved overview and also enable you to better present it to your clients. We hope you’re as excited about the great news as we are and that you enjoy them to their fullest! New design is indeed really good. I liked how user friendly the new interface is. I saw some of the features realized on this writing service website, but you managed to do the same things work better. I wish all the website owners care about the design as much, as you do.